Early-Onset Tiredness: Are you affected?! Have you experienced any of the following symptoms at or before 7:30 pm? Does an average day of parenting/working/errands/cooking/laundry have you feeling blah? Do you find yourself already looking forward to tomorrow morning’s cup of coffee when your dinner has barely been digested? 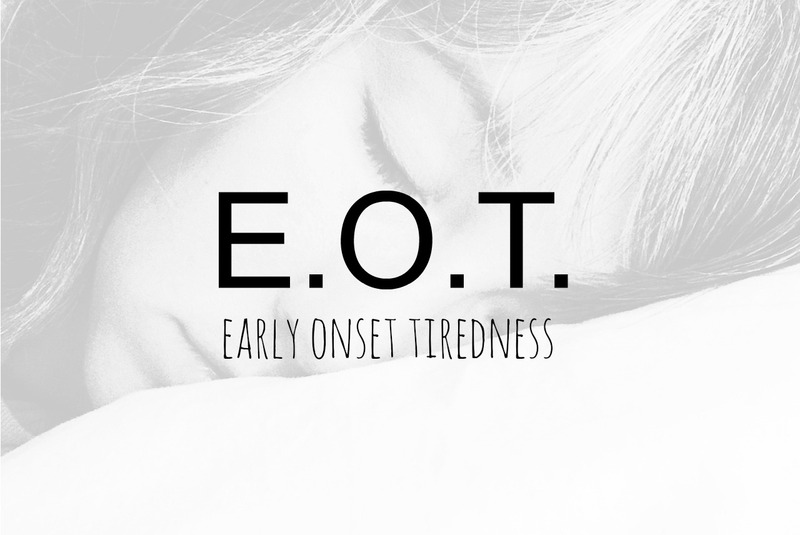 If so, you may be suffering from Early Onset Tiredness (EOT). Risk Factors – Do these sound familiar? Don’t believe the hype that these are just normal parts of the human experience! These are dangerous circumstances that can all manifest in an ever-accelerating downward spiral. Notice the signs. Take charge of your health. Don’t be a victim. Warning Signs and Symptoms – Seek help immediately! If you or anyone you know has experienced the following symptoms, don’t ignore it! Reach out and lend a hand. You never know…the life you save may well be your own (or your child’s…just sayin’). Treatment Options – Will that be fudge ripple or chardonnay? While, unfortunately, there is no cure available for EOT, there are multiple treatment options. Those who are bravely living with this condition cite two common refrigerator occupants as their most-effective forms of relief. First, there is the less expensive and more easily obtained ice cream. Any variety will do; bars, sandwiches, and sundaes have all been proven effective. Although, it is commonly believed that those products that include chocolate have a quicker reaction time. Next, while sometimes more expensive and with an age-restriction for purchase, there is alcohol. Wine, cocktails, spiked hot beverages…the choice is really up to you. But, be careful! Overindulgence in this treatment option could lead to a worsening of symptoms the next day. Other treatment options include changing into pajamas, washing your face, drinking some water, and catching up on that stuff you forgot was on your DVR. Be warned, though! While it may seem that actually going to bed early would be a viable treatment option, the side effects make are often worse than you would expect. Insomnia, RBS (racing brain syndrome), and ITSC (irrationally thirsty sleeping children) are real and can happen to anyone at any time. Living with EOT – There is hope! Well, I think there’s hope. I honestly don’t see a light at the end of this very dark tunnel. Or, then again, maybe that’s just my eyelids drooping again. G’night, friends. And sleep well. You know, once you’ve fallen asleep on the couch and then someone you love tells you to get your overtired behind to bed.